Does anyone have further advice? great advice in that post. -do not sell more than 5% of your holdings in any given year even if everyone is shouting about bubbles, tops, and tulips. this applies to blockchain forks as well. MystryBox, a good set of advice. I'm not sure about #3 on the what-not-to-do list just because I think assumed anonymous nature of cryptocurrencies was one of the things that got people really excited about bitcoin in the early days (before people realized how straightforward it would often be to link an anonymous "wallet" to a particular person). So I still think the anonymous cryptocurrencies are likely candidates if there ever is a significant switch from bitcoin to something else. That said, even if I'm right about that, you certainly raise a very valid point about the difficulty of getting money back out of crypto without looking like a potential drug dealer if you've got a lot of money sitting in monero or zcash (or whichever other anonymous coins are out there). Dude, if you want intrinsic value, you want stocks, or land, or useful commodities, or something else that produces something. No currency (at least none that I'm aware of) has "intrinsic" value, bitcoin included. In fact you don't really even want currency to have intrinsic value, since you want it used for exchange, not hoarding. is a 24/7 global, secure, cheap, fast, censorship-resistant payment network not producing value? are visa, paypal, and western union valueless as well? I cannot speak for Walt, but I certainly think the bitcoin network and the ability to send payments all over the world is producing value. But the folks who produce that value (and get paid for it) are the miners, not the folks who hold bitcoin. Now if at some point in the future there is a switch to a proof-of-stake instead of proof-of-work on a major cryptocurrency (I think that is still on Ethereum's roadmap), then the folks who just buy and hold the currency could, indeed, be producing value. Now if at some point in the future there is a switch to a proof-of-stake instead of proof-of-work on a major cryptocurrency (I think that is still on Ethereum's roadmap), then the folks who just buy and hold the currency could, indeed, be producing value. i don't know how Ethereum's PoS will work but i imagine it would have to somehow involve spending money on electricity and computer hardware to process transactions and store the blockchain -- therefore a nonzero input to keep generating value via the payment network. 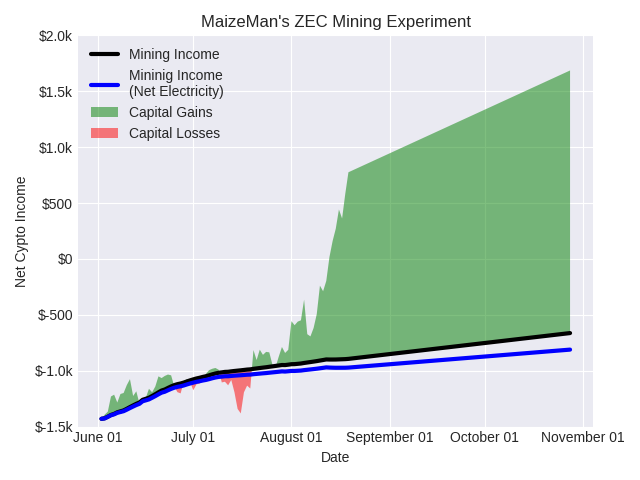 It's been a long time since I've updated on my ZEC mining experiment. * I stopped updating because the capital appreciation on the fees from ZEC mining which I was holding in bitcoin was going up so fast that it really dwarfed the financial effects of continuing to mine. But my mining rig has continued to chug away in the corner of my basement the last couple of months, so I thought I'd pull together an update. The last data in my records is from August 18th, 2017, at which point I had climbed out of the ~$1,400 cost of setting up my rig and was up ~$800 (so total gain of approx. $2,200) based on ~$550 of mining income with the rest coming from capital appreciation. Two months later I'm up to ~$1,700 net (so total gain ~$3,100), with mining income at ~$750. I don't have detailed records for the last two months, but whenever I've checked my rig has been pretty consistently pulling in $100/month (~3x the cost of the electricity). People seem to have mostly stopped talking about investing in mining hardware (or maybe it's just an artifact of which forums I do or don't frequent), which is consistent with the profit from mining being a lot more stable. All in all, I may still break even on the cost of hardware from mining fees at some point. I certainly did end up making money as the result of this experiment, but it was from an unconsidered side effect of my plan (holding more cryptocurrency), not the actual thing I set out to do (turn a profit from setting up a bunch of GPUs in my basement). *Original details here on the first page of the thread.. Details on power usage here on the second page. Agreed, but the vast majority of the current computer hardware and energy usage from cryptocurrencies that use proof of work (basically all the big ones everyone has heard of right now) isn't spent on storing the blockchain or communicating about transactions, it is spent on what is essentially a security measure to prevent people from rewriting the blockchain (churning away at asymmetrically hard math problems). In proof of stake you probably still need to have a computer running in order to help mine (or do they call it minting with PoS? ), but you don't get extra minting/mining rewards from having extra more computers/CPUs/GPUs/ASICs only from owning more of the currency and being willing to stake that currency on not allowing invalid transactions to go forward. Just wanted to chime in and say thanks for the comments. While I do feel that crypto could be hanging on a speculation bubble, I truly am excited about the possible applications of the underlying technology, especially in areas beyond basic currency exchanges. I'll certainly be keeping my eyes on things and the technology continues to progress. - Exchanges are likely to run into regulatory issues converting them to fiat in large amounts in many countries. - I suspect large institutional traders and hedge funds will avoid them precisely because of the anonymous factor/darknet-link and the above exchange issues. Value won't go very far without larger traders buying. I think cryptos that are normally traceable but can have anonymization when needed (like eth and bitcoin will eventually support) are better investments than a fully anonymous crypto. JMO. I would recommend if you invest in anonymous cryptos and expect significant gains, you should leave them on the exchange. Then when it is time to sell there is no question about where they came from. These concerns are only for significant amounts of crypto. And if you have a lot of crypto you can run into other problems like hidden caps that some exchanges have on fiat movement, even if source of funds isn't a problem. For example I believe Kraken has an annual limit where even for highest tier customers it would take you literally 10 years to cash out of a million dollars worth of crypto off the exchange. So make sure your exchange will actually handle the value you expect to end up with. Thanks! I certainly don't have direct experience cashing out large sums of cypto (anonymous or otherwise) so it's great to hear from someone who has gone through the process recently and seen where the potential snags are. Maizeman, I continue to love the clarity and reliability of your mining reports. MystryBox, welcome to the forum. The most recent Bitcoin difficulty change was pretty significant. It dropped my daily BTC earning from about .00185 to about .00146. Back when I first got this rig in July I was earning about .00269. So it has dropped by almost half in about 3 months. Luckily the price has skyrocketed since then as well. I believe I'll still be profitable with my mining for the foreseeable future, but the difficulty has risen significantly with all the recent BTC price increases. I'm curious to see how the hashrate responds if the 2X fork ends up going through. I'm torn, I think the 2X fork is wreckless and poorly executed because it doesn't have replay protection, but I wouldn't mind seeing some hashrate go to another chain to allow BTCs difficulty to go down or at the very least hold steady for a while. That's a good point, lifeanon. I should have specified that, stated in dollars, my mining income has been relatively constant. However, since the price of bitcoin in dollars has increased over that time period, stated in bitcoin, my mining income has continued to decline over the last several months. I would encourage you to read through the entire post. You may find useful information. I self-manage. However, trusted names in the passive index fund space are Iconomi and Prism, with fees. Both sites should also give you the ability to pick and choose. Security wise, I would also recommend a new, nonrefurbished device exclusively for crypto related activities and websites (don't use it for normal web browsing); or boot off a linux disk. SegWit had wide support right up until adoption and that support had to remain for a vast majority of blocks in order for it to be activated. Support for SegWit2X however has been declining a lot lately. The support numbers you're showing is just miner signaling (of which Bitmain is a heavy SegWit2X supporter) and miners don't own and dictate the entire network. How is a hard fork (with no replay protection) a more conservative solution than a UASF that was thoroughly tested and even saw exposure on another very similar blockchain (LTC)?? I've yet to hear of a defense for having a hardfork without replay protection. Many prominent companies (Coinbase, blockchain.info, BitPay, Xap, Jaxx, Circle, bitcoin.com, etc) signed this agreement and now they are being propagandized against by core blockstream as dangerous to bitcoin. It's very ironic because these are the very companies that help users to acquire and use bitcoin. They have invested significant amounts of time and finances into building up the infrastructure, very much skin in the game. They are deeply enmeshed in the entire space. Now, "they're enemies of bitcoin". I have nothing further to say about the matter. I just hope newcomers reading the debate don't become misled by misinformation. In Satoshi's words: "If you don't believe me or don't get it, I don't have time to try to convince you, sorry."